Can the Big 12 – in its last full year of existence – challenge the SEC for supremacy of the college football universe? For the second time in five years the Sooners are coming off a disappointing eight-win campaign marked by injury, upsets and overall discontent. The Sooners bounced back from an 8-4 mark in 2005 to go 11-3 in 2006 and earned a Big 12 title. With a look at the talent they have back on both sides of the ball a similar season is almost expected in Norman this season. Landry Jones was the biggest beneficiary of Sam Bradford’s injury last season and now enters the year with a load of experience and confidence. He will be working with stud runner DeMarco Murray and three returning starters at the receiver position. Defensively, they are young but talented and a lot rests on Travis Lewis and Jeremy Beal. Oklahoma has to play nine of its 12 games against teams that were in bowl games last year. However, they lost three games by a field goal or less last year – despite their injury issues – so they very easily could have been 11-2 instead of 8-5. This team is the class of the league and a true national title contender. With USC’s castle now crumbling into the sea, Texas now holds the mantle of being the No. 1 Football Factory in the country. The Longhorns are 69-9 over the last six seasons and an exceptional 25-2 the last two years. It’s tough to bet against that, as the Longhorns reap the benefits of the fertile recruiting ground of Texas high school football. This season may be a bit of a transition season, as the club tries to avoid a letdown from last year’s national title near miss. They will be breaking in a new quarterback and they lost a load of talent on defense to the NFL Draft. But programs like UT just reload, year after year, and even with just 12 returning starters I don’t see why we should expect a steep drop off from this group. In a scheduling quirk, Texas only has to leave its home state twice – a game at Nebraska on Oct. 16 and a trip to Kansas State on Nov. 6. The Longhorns finish with five of six at home after their game in Lincoln and should have a lot of momentum heading into a likely BCS bowl. The Cornhuskers would like nothing more than to win one last Big 12 title before bolting to the Big Ten. Nebraska came within two seconds of toppling Texas in last year’s title game and will surely be using that close call as motivation. Bo Pelini has done a masterful job of rebuilding this program quickly and getting it back to national prominence. The trick is staying there. But with one of the top four of five defenses in the nation at his disposal, led by three players that garnered either All-American or All-Big 12 honors last year, Pelini should manage just fine. After a banner offensive year in 2008 saw them score more than 35 points per game, the Huskers struggled to score during the last two months of last season, averaging just 18 points per game in conference play. That has led to a quarterback battle this fall and some shuffling along the attack. Nebraska avoids Oklahoma and they get Texas at home. They should cruise to a Big 12 North Title but a win over the Longhorns, and W’s in tough road games at Washington and at Texas A&M, could open the door for a potential national title run. Mike Sherman is entering his third year in College Station and appears to have his best Aggies team yet. Last year a ridiculous amount of freshmen and sophomores started or earned significant time on the two-deep. But the good news is that just about everyone is back (16 returning starters) and now the Aggies have one of the most experienced clubs in the Midwest. A stellar 82 percent of their tackling is back from last year, which is one of the highest totals in the nation. That goes along with a three-year starter at quarterback that has full control over Sherman’s offense. The Aggies played too soft last year and the defense got lit for 47 or more points in four of 12 games (and hit for 60 or more twice). If they want to improve those numbers have to go down. The schedule is not forgiving, with tough crossover games against Missouri and at Kansas. Also, the Aggies have to play Oklahoma, Texas and Nebraska. So while they aren’t a threat for the conference crown they could have a say in who does earn it. Well, right now the surprise with the Tigers will be if anything actually goes right for them this preseason. Missouri entered the spring as the one legit challenger to Nebraska in the North, but injuries, suspensions, and all manner of off-field distraction looks to derail this program before they even play a snap. Three Mizzou players have been busted for DUIs just this month, and starting running back Derrick Washington is suspended pending a sexual assault charge. It’s all awful karma. But they have 16 starters back from a team that vastly overachieved in 2009,winning eight games in what was a clear rebuilding year. Gary Pinkel has a proven system and Blaine Gabbert may be the best quarterback in the league. 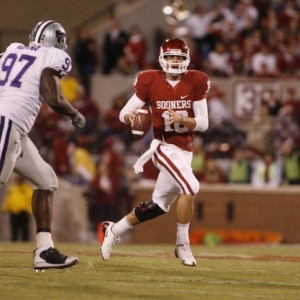 But after an Oct. 23 date with Oklahoma they have just one more home game (in their last five). So what seemed like a team ready to compete is now looking like a team that could sink – quickly. There’s just no one left. After back-to-back nine-win seasons – last year’s being a disappointment after high preseason expectations – the Cowboys have just eight total returning starters, a new quarterback, and the least experienced team in Div. I. I don’t know that expectations are all that high, but I don’t think anyone is expecting them to go out and throw up a 3-9 season -- but I think that’s entirely possible. They are moving to Texas Tech’s spread offense, but I expect a rocky transition in this first year before taking a step forward down the road. Texas Tech – The Red Raiders will look a bit different in Year 1 under Tommy Tuberville’s regime. He has already said that he wants to put more focus on defense and should “tone down” Tech’s high-powered passing game. The cupboard is pretty full here, and I actually think that Tech may have more talent than more hyped-up rival A&M. They have a loaded set of skill players and four three-year starters on defense. Overall they have 16 returning starters now that Taylor Potts has retained his QB position. They avoid Nebraska and get Texas at home. There may be some value here while people wait to see how Tuberville pans out. I think he’s a quality coach and even if they use different means I think that Tech will again threaten nine wins and a bowl. Baylor – Unfortunately, Baylor was set up for success last year but had their season submarined when Robert Griffin blew out his knee last September. Griffin is back, which is a plus, but they are much, much less experienced and talented. They also have a brutal schedule after a soft opening, and from Sept. 18 to Nov. 6 they play at home just twice in eight games. This team has averaged about four wins per year since 2004. They’ll be right there again this time around. Iowa State – Iowa State is coming of an exceptional (by their standards) 7-6 season that included an upset bowl win over Minnesota. I’d love to say that they’re going to build on that success, but they aren’t. The Cyclones have one of, if not THE, most challenging schedules in the country. It includes road trips to face Top 15 juggernauts Iowa, Oklahoma and Texas, as well as home games against Nebraska and Utah. The defense overachieved last year, but that was a veteran group and just four starters return. That will cancel out what they gain by having slick Austen Arnaud and Alex Robinson. This team will score some points and be competitive. But it should be another losing year in Ames. Kansas – It’s a big-time transition year in Lawrence, as Turner Gill takes over after the bitter dismissal of Mark Mangino last year. Besides losing Mangino, the Jayhawks will have to replace one of the winningest senior classes in school history, including vets like Todd Reesing, Jake Sharp, Kerry Meier and Dez Briscoe. I think that Gill is a great coach and that he’ll have some success in the Big 12. And even though the Jayhawks are going to be significantly worse this year they could top last year’s five-win total. They miss Texas and Oklahoma this year and have five of their last seven at home or in Kansas City. Kansas State – Bill Snyder has made an instant impact in Manhattan (again) and really got a lot out of his substandard talent last season. What can he do for an encore? I’m not expecting much, even though this team only has to leave the state once before Nov. 13 (you read that right). The home-heavy schedule will at least keep them competitive but they just have 11 starters back, a new quarterback and all new wideouts, This team has some juice in the secondary and along the offensive line, which are good places to start. But overall this team is a dud. Colorado – I actually think that Colorado could sneak up on some people this year and I thought about using them as the Surprise Team. Dan Hawkins is obviously a horror of a coach. But he has the most experienced team in the Big 12 and one of the most veteran teams in the country. There are 17 starters back – including all five on the offensive line – and now that Hawkins has benched his nimrod son and named Tyler Hansen quarterback the offense could take off. The schedule is not easy. But they should actually be favored in four of their six home games, with other winnable games against Colorado State in Denver and at Kansas. That means just one upset somewhere along the line and all of a sudden this could be a seven-win team for the first time since 2005.